The 14th Annual Greater Boston Walk Now for Autism Speaks is set for this Sunday at the Xfinity Center in Mansfield, Mass., just south of Gillette Stadium. And, for the 11th year BU Hockey is actively involved at the “Walk” as well as in other activities with the Autism community throughout the school year. Details of the day’s activities, including the walk, and musical and reading performance are here. Terrier sophomore Doyle Somerby teamed with BU women’s basketball junior Clodagh Scannell for a special video invitation to participate in the Boston Walk Now event. All event proceeds support Autism Speaks’ work, both locally and nationally, to increase awareness about autism, fund innovative research and family services, and advocate for the needs of individuals with autism and their families throughout the Greater Boston Community. Terriers at the 2012 Autism Walk event at Suffolk Downs. ► SB Nation’s Jeff Cox reports on Five Reasons to Believe for Terriers’ fans. ► In case you missed it, Episode 2 of Inside BU Hockey has been posted with Corbett's interviews with Coach David Quinn, Associate Coach Steve Greeley and freshman forward Nikolas Olsson. ► The Providence Journal’s Mark Divver reports that highly regarded NTDP U18 forward Auston Matthews is talking to four NCAA schools, including the Terriers. A late 1997 birthdate, he’s a junior in high school. Last season, he was called up from the U17s to to skate with the U18s in the IIHF World U18 Championships, won by Team USA. 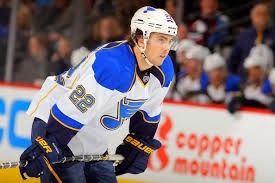 The St. Louis Post-Dispatch reports that, according to Blues’s coach Ken Hitchcock, Kevin Shattenkirk has been the team’s top defenseman thus far this season. #6 Terriers are back on the road and that road doesn’t get any easier as the competition is #7 and defending NCAA champion Clarkson. The Terriers and Golden Knights play a pair of 3 p.m. matinees today and tomorrow. These two teams last met in 2013, when BU defeated Clarkson 5-3 in an NCAA quarterfinal game that was held at Walter Brown Arena. After two regular-season games, sophomore Maddie Elia (photo) leads BU in scoring with four points.